Sports Economics is the ideal introduction for all sport management and sport policy students and those for whom economics is a relatively new area of study. The book will also provide an ideal introduction to sports economics for economics students new to the area. 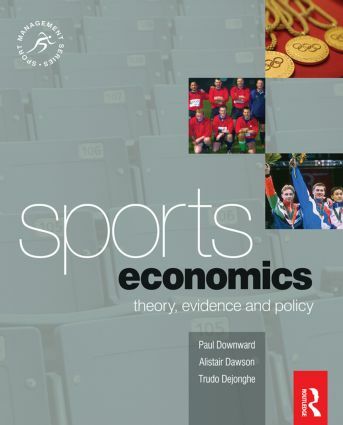 Specifically designed to make economics accessible the context of sport is the focus of analysis, ensuring that this book is lively, accessible and approachable. Whilst truly international in scope, it focuses particularly on specific comparisons between the US, the UK and mainland Europe. The breadth of discussion and international emphasis is brought to life by a detailed discussion of the evidence throughout the book to illustrate the key themes discussed – ideal for both lecturer and student. Reflection questions and boxes are also used in chapters to prompt the reader to think about specific points as well as to provide the context for specific theoretical or empirical contributions that have been used to analyze sport. Dr Paul Downward is senior lecturer in sports economics at the Institute of Sport and Leisure Policy, University of Loughborough. Along with Alistair Dawson he is the author of the textbook 'The Economics of Professional Team Sports (Routledge:2002). He has just finished editing a book for the Office for National Statistics on the Use of Official Data in understanding Sports, Leisure and Tourism markets. In addition he has also undertaken Consultancy work for Sport England on participation and UK Sport on Volunteering at the Manchester Commonwealth games. Outside of these areas Dr Downward has also published in the Philosophy of Economics, and Pricing Theory. As well as refereed papers he also has a book in each of these areas. He currently teaches on three modules at Loughborough University; Sports and Leisure Industries, Managing Sports Organisations and Olympic Studies. Alistair Dawson retired from Staffordshire University in 2000 but maintains an active research interest, particularly in the theoretical problems surrounding the measurement of uncertainty of outcome. Apart from 'The Economics of Professional Team Sports', with Paul Downward Alistair has produced articles (published and forthcoming) in team sports economics. Other fields in which Alistair has published include the econometrics of wage inflation, and the application of computer business and macroeconomic simulations to undergraduate learning and assessment. Dr. Trudo Dejonghe is docent (professor) at the Lessius Hogeschool Antwerpen and guest lecturer in VLEKHO Business School Antwerp, Hogeschool Brugge and Copenhagen Business School. He is the author of "sport en economie: een noodzaak tot symbiose"(sport and economics: a symbiotic necessity) (Arko Sports Media 2004) and "sport in de wereld: ontstaan, evolutie en verspreiding" (sport in the global space: evolution and diffusion) (Academia Press, 2001;2004). He has researched the location-allocation problems of football clubs in Belgium(2001) and the Netherlands(2005).